Indulge and relax, relive and spice up you exotic holidays in Dharamshala and Dalhousie may it Honeymoon or family vacations or adventure tour. You can even customize tour package like Pathankot to Pathankot or Volvo tour package for Dharamshala. This Package gives you the best of Himalayan Scenic beauties, the sight of seat of His Holliness Dalai Lama in Mc Leodganj, the excursion tour of Khajjiar called as “Mini Swiss” and Charming Village Chamba. On arrival check-in to hotel Grand Legacy. Rest of the day at leisure. Dinner & overnight at the hotel. After breakfast, visit the Golden Temple- centrally located the most visited tourist attraction of Amritsar Golden Temple welcomes everyone regardless of the religion or faith one follows. After noon visit to Wagah Border Wagah is 28 kilometers from the Amritsar main town. A good number of visitors come to this place to see the change of guard’s ceremony and the flag hoisting and lowering activities which are done with great skill and precision by the border security forces of both the countries. A site you cannot afford to miss. Overnight at hotel. After breakfast depart by surface to Dalhousie. A picturesque and popular honeymoon and spiritual hill station, Dalhousie was set up in 1854, as a retreat for the British soldiers and bureaucrats. Located atop the five hills of Kathalagh, Potreyn, Terah, Bakrota and Bhangora, it was named after the British Viceroy Lord Dalhousie. Surrounded by snow-capped mountains, and situated on the western side of the mountainous ranges of Dhauladhar. Explore the hill station on your own and enjoy the natural beauty. Dinner and overnight at Hotel. After breakfast depart by surface to Khajjiar (25 kms one way). Flow through mesmerizing experience. 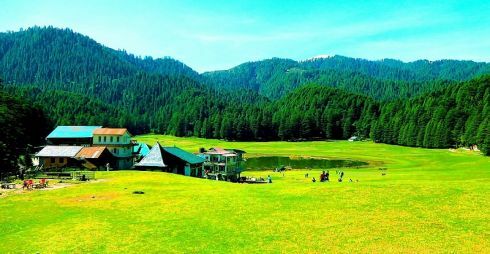 The vast emerald green meadow of Khajjiar with its thick forested slopes of deodhars, the stupendous mountain views from Lakkar Mandi, the unparalleled beauty of Kalatope and Bakrota Round. Return back to the hotel in the evening. After sumptuous breakfast depart by surface to Dharamshala. The Hill station is set in the background of Dhauladhar Mountains; Dharamsala is perched on the high slopes in the upper reaches of Kangra Valley. Dharamshala overlooks the plains and is surrounded by dense pine trees and Deodar forests. A nearby snowline with numerous streams and cool healthy atmosphere makes the surroundings very attractive. The colorful temple and Gompas, which reflect the culture of Tibet, adds attraction for the visitor. On arrival check-in to hotel. Explore the hill station on your own and enjoy the natural beauty. Dinner & overnight at the hotel. After breakfast visit the Tibetan Monastery, St. John’s church in the wilderness, Triund Peak, Dal Lake, Naddi. Shop in the bazaar for Tibetan handicrafts in the evening. Dinner & overnight at the hotel. After breakfast depart by surface to Chandigarh.On arrival check-in at hotel. Dinner & overnight at the hotel. After breakfast visit Rock Garden a magnificent arrangements of rock fossils, broken chinaware, discarded light tubes, broken and waster bangles and glasses, building waste, coal and clay all mixed and created a dream folk worlds of palaces, soldiers, monkeys, village folk etc. If time permits you can visit to Sukhna Lake-set in the pictures backdrop of Shivalik ranges it attracts migratory birds from around the world. Later you will be transfer to airport/Railway station for journey back to home.